Sunday September 6 tune in to VOB 92.9 FM @ 6pm when Mario Porchetta, percussionist and the leader of Jazz3, is the guest on the BJS Jazz Hour with host Barry Taylor. Mario Porchetta – percussionist and the leader of Jazz3 a trio that combines modern and traditional jazz with Caribbean rhythms will be featured guest on BJS Radio Show. Mario has performed in Europe, Africa, Asia and in the Caribbean including performing three times at the Barbados Jazz Festival and at the St. Lucia Jazz festival. Barbadian Saxophonist Joseph Callender took the audience ‘On the Other Side’ at his recent sunset concert at Frank Collymore Hall. ‘On the Other Side’ showcased Joseph’s amazing talents on the sax as he dazzled the audience with his original compositions and familiar covers, including made famous by Earth, Wind and Fire. Thank you to all patrons who contributed very generously to support Joseph’s studies at Humber College. Contributions to the Joseph Leo Callender Education Fund, Scotiabank, Rockley Branch, Account #810149, continue to be gratefully accepted. Young Barbadian Saxophonist Mylon Clarke shares his experiences with BJS Jazz Hour host Jerome Jones following his win of the prestigious Berklee College of Music Summer Scholarship 2014. Mylon is a graduate of the Barbados Community College Music Program. 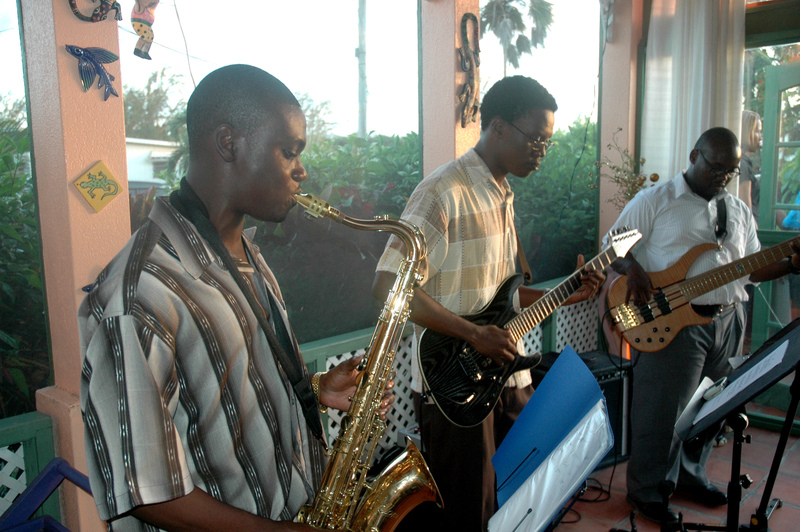 Sagicor Christmas Jazz is an annual event in Barbados. The Sagicor Christmas Jazz Summer Scholarship is a 5-week award that includes full tuition at the Berklee College of Music in Boston and all expenses. Barbadian trumpeter Kweku Jalani, winner of the 2015 Sagicor Christmas Jazz scholarship, will be heading off to Boston this summer. Mylon Clarke entertains at a BJS member’s mingle. Along with Mylon is Darrin Massiah on guitar & Lorin Jackson on bass. Check out Mylon’s gigs around Barbados. For listing on this site go to Live Jazz Barbados. You will not want to miss this jazz evening . . .
Canadian Jazz pianist Steve Koven is back in Barbados to perform with friends from the local jazz community. Tuesday February 17 Steve performs at Lobster Alive with the Roger Gittens Quartet. Jazz time 7pm. Reservations are a must! Steve Koven is a composer, performer, producer and educator. In 1993 Steve established the Steve Koven Trio. 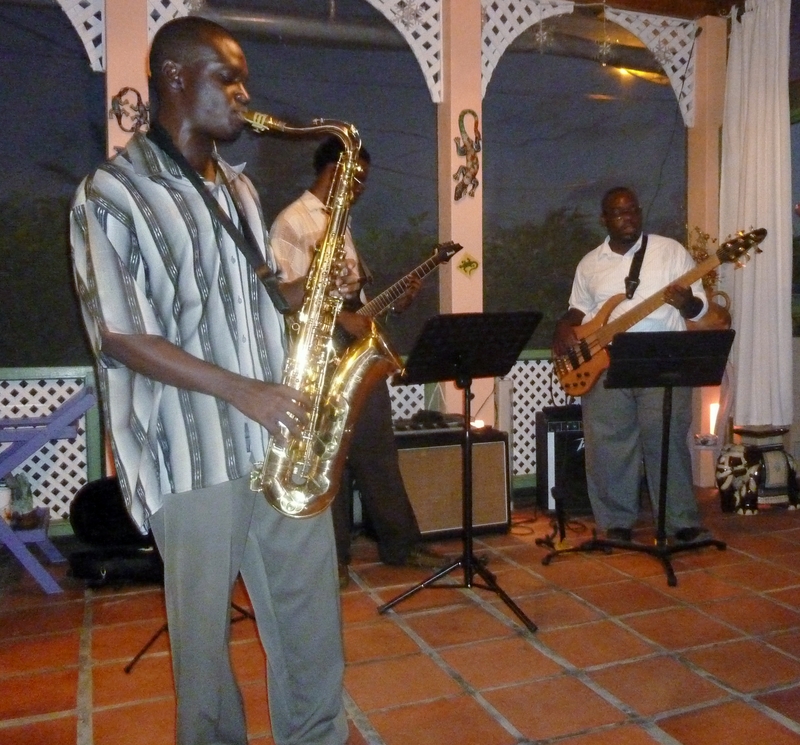 The Steve Koven Trio performed in Barbados at The Waterfront Cafe. Steve has performed solo for audiences at the Frank Collymore Hall and done gigs with local musicians at many of the jazz venues in the island. Aside from performing world wide with his trio, Steve also performs solo piano concerts throughout North America, Europe and the Caribbean. Dozens of Koven’s compositions have been licensed for national and international film and television productions. As an educator, Steve has been teaching in the Faculty of Music at York University since 2003, teaching Contemporary Improvisation and Jazz Piano. In addition, Koven also teaches Music at Toronto’s Centennial College. He holds a Masters in Music Composition and has presented master classes and clinics in Barbados, China, Japan, Colombia, The Bahamas and Mexico. Steve lives in Toronto with his wife Lee-Anne. Neil Newton is a bass player, sound engineer, arranger and composer with a unique sound. His superior grooveability and amazing attention to tone and texture make him one of the most respected bass players in Barbados. He has played with notable artists and musicians such as Arturo Tappin, Kite, Stefan Walcott and Eddie Bullen, at local, regional and international events and festivals. He joined with long time friends and colleagues David Carnegie and Stefan Walcott to form The Original Unit, a jazz trio that combined elements of Caribbean music, straight-ahead jazz, soul, electronica and free improvisation. Neil continues to be very busy and much in demand; he can be seen playing at various events in a range of musical genres.